SavageXS Flux – a.k.a. mini savage « Big Squid RC – RC Car and Truck News, Reviews, Videos, and More! We first saw the SavageXS Flux at Nuremberg. Now here it is stateside. While it’s still in prototype form, the word from RCX is that it should be hitting mid-summer. It’ll come from the factory RTR, with a waterproof 2.4 GHz radio system, Flux brushless system, and a top speed on 3S of about 60 MPH. I’ll be posting more photos later, so keep an eye on the front page. 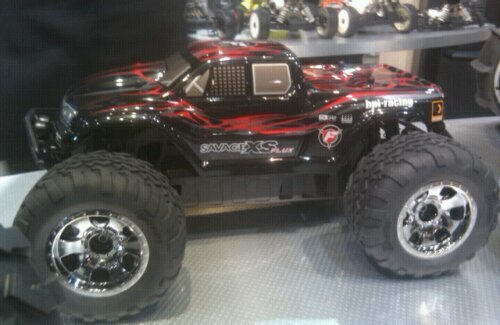 Update: Forgot to mention that HPI is aiming for a sub-$300 price point on this bad boy.